To me pets are a very important part of home. I think you are a pet person or not. I am in the firmly pet person and mostly, cat person camp. I had to do a very hard thing last week. One of the hardest you can ever do as a pet lover. 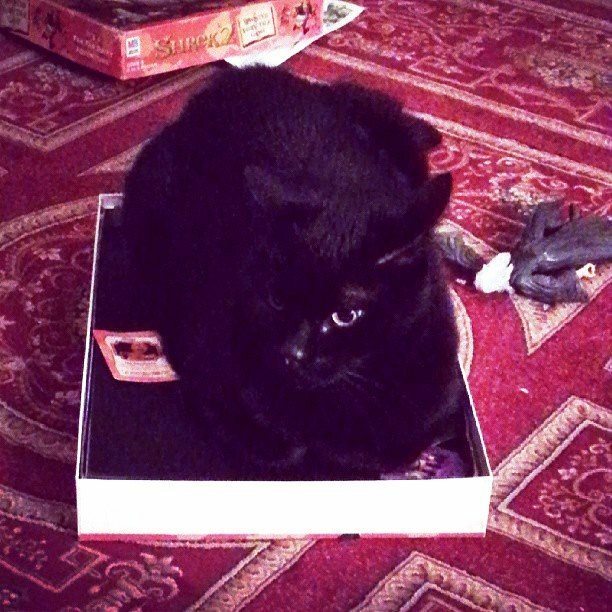 I had to make the call that it was time to say goodbye to my dear, feisty, diabetic, black cat. Morris came into our lives as a rescued creature. My dear friend Allison who has also now passed away in tragic circumstances, called me one day as she knew I was looking for a new kitten. Someone had dumped some kittens at her vet and she thought I may be a forever home for one of them. I bundled my then 3 year old James into the car and went to have a peek. It was instant love. If you have ever been or are a cat person, you will know what I mean. You can love all of them, but when you go to choose a cat, usually they choose you. He was soooo tiny. Only 3 weeks old at that point, little tiny feet and ears and tail. And we fell in love.”We will take that one” I said. And a week later the Vet called to say we could take him home if we were confident we could care for him. I could fit him into my pocket and carried him around in my dressing gown. I remember syringing milk into his tiny little mouth and later, when he started solid foods, washing his teeny tiny face after he face planted in the saucer while he learnt to eat with no Mother or siblings to show him the way. As he grew, it was clear he was unsure where the line between human and cat really lay. Perhaps he thought he was human, or we were all cats. Whichever way, he spoke to me often, would call and take me to the bedroom for big cuddle sessions, reach out and grab my leg or arm as I passed to stop me for a moment, and open doors with his paws. Sometimes he could be found with the corner of my dressing gown or a sock in his mouth, purring and kneading away with pure happiness. He could also take down a mouse, scratch a sofa and take up the entire couch as perfectly as any other cat. So his human and cat behaviours were in perfect balance. Our other old orange cat, Oscar, was not quite as happy as the rest of the family at this new arrival and even less impressed with his kitten antics, but it was not long before he took him under his wing. Our dog, a black Lab/Cocker Spaniel cross called Jumbo and Morris, became firm friends. My husband thinks perhaps because they were both black. Nice theory but I tend to think it was because they were both generous of heart and open to love. Morris would roll on his back whenever Jumbo the dog came by and would wait at the gate for his return after his nightly walk with my hubby. He took the arrival of our third baby in his stride and would sleep some of the days on each of our boys beds to share his love around. He even accepted our little Juno cat a couple of years ago, when the very person who led me to Morris passed away and I went out to find a new cat to cuddle, a new life to make up for the loss of my young friend who I had sat with as she died. Morris was a tolerant, loving and softly spoken fellow who would also stand up to the pressure and chase off other cats trying to attack our little Juno cat and kept control of the patch. After we had to put down first the old orange cat and then the dogs, he became anxious and started to overgroom, creating a persistent sore at the base of his tail. The Vet suggested he was grieving. After a while this sore did not settle. He became thinner, sicker. I worried and eventually a diagnosis of diabetes was made. Given I have type 1 diabetes and work in diabetes too, this was one of those moments! We could not believe the irony. However it did mean we could share insulin!! Sadly this became a revolving door of vet visits and a slow demise. He was never the same and after many things going wrong, we reached last Friday. Playing Shrek – the boardgame! It was an ordinary day. It was not a long planned thing. It simply happened and then, all of a sudden, it was time. I went alone. He complained to me all the way to the Vet as usual. He hated the Vet. He made it difficult for them as usual, as they tried to get a cannula into his arm and so they had to give the feisty bugger some gas first. He was himself right to the end. I cuddled him and spoke to him as he passed. I cried. My Vet sent flowers. I cried some more. I still have some more crying to do. When he returns to us we will sprinkle him into the soil in the front garden where our old orange Oscar cat lies. He would have liked that. Watching over us. 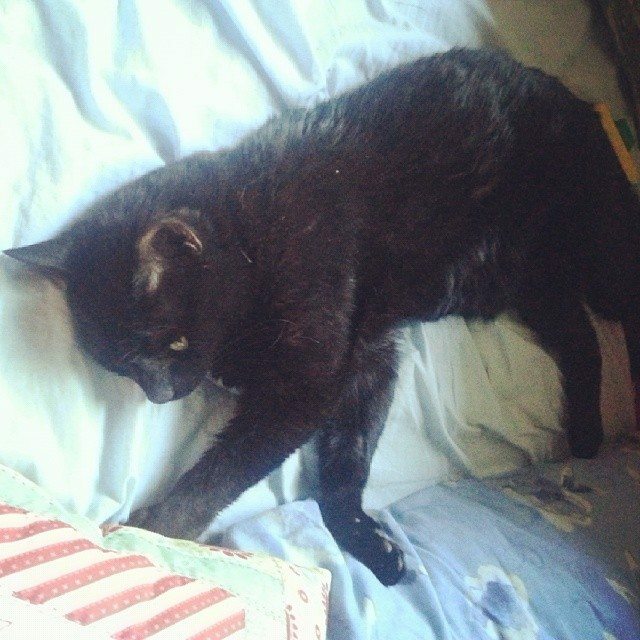 Vale my Morris, my friend, my black cat. It was a good life and I am glad to have shared it with you by my side. My commiserations! We have been there any number of times ourselves. 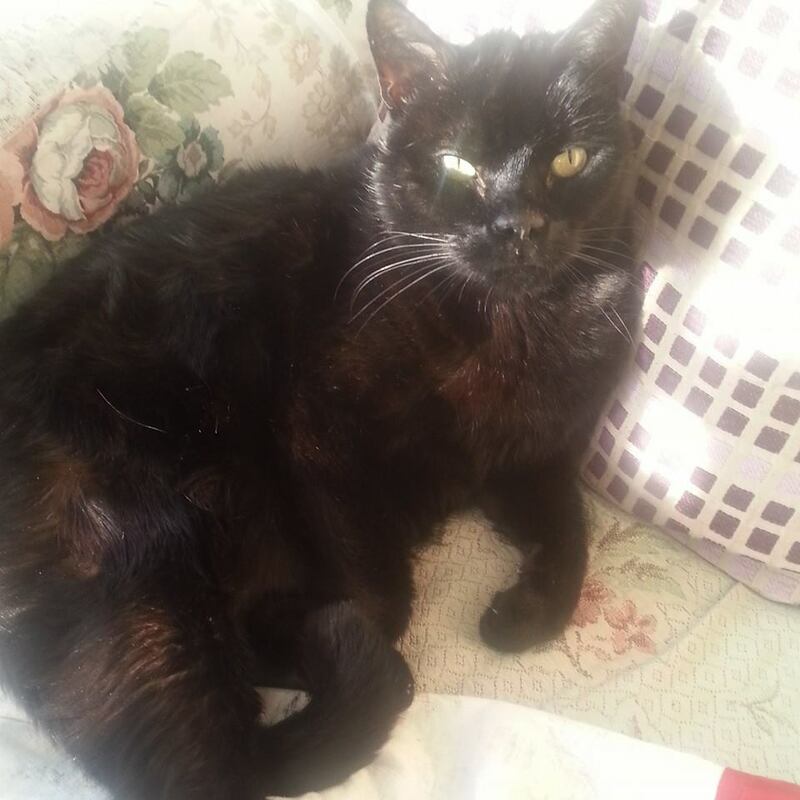 In particular we had a lovely little cat who developed diabetes and never complained when I gave her her needles. When they are so dependent on you it develops a special bond. I hope you will eventually find another little furperson that can share its life with you. Best wishes. Ian & Helen. What a blessing it is to have a family pet this special. Your sons will be more emotionally robust because of their interactions with & grieving for the loss of this dearly loved black cat. Vale Morris.